When All Is Said and Done, Will You Hear the Words: "Well Done"? Are you using your talents? Or are you, like the wicked servant in the parable, burying what Jesus Christ expects you to put to work for Him? For salvation's sake, let's consider! Jesus Christ was not pleased when His servant told Him he had not used the talent he had been given. That servant feared Jesus' authority, for he "knew" Jesus was a "hard" man (Matthew 25:24). Jesus called him a wicked and lazy servant — and cast him out! Are you hiding a talent? God created human beings in His own image — the only part of the physical creation given the prerogative of thinking, planning, designing and bringing to fruition the results of that creative effort. We are to become part of the supreme creating Family of almighty God. To prepare to be creators, we must be learning to be creative. Quite often we nurture ideas, thoughts and concepts that seem to have some degree of merit, but we fail to act upon or follow through with them. For one reason or another, we fail to exercise our potential to contribute constructively to areas where we have responsibility. Paul reminds us: "For you see your calling, brethren, that not many wise according to the flesh, not many mighty, not many noble, are called. But God has chosen the foolish things of the world ... and God has chosen the weak ... and the base ... and the things which are despised" (I Corinthians 1:26-28). If we are not careful, we can be deceived into thinking we are totally useless and incapable of producing any good fruit. We can become fearful, just as did the servant in Matthew 25. God called each of us separately (John 6:44) because of something He saw in us that He can use in His overall plan of salvation. Of course, the ultimate reason for our calling is eternal life in the God Family, but that opportunity is to be offered to all humanity later on (II Peter 3:9). God's is not a hit-or-miss process like throwing darts at a board, but one of design — of creativity. There are no chance callings — each is thought out in advance. God had an idea — a thought, an effective, helpful, productive concept — and He is bringing that idea to fruition. Each of us, as part of His begotten Family, has the same potential to create — to add to the plan of salvation. We have minds with which we can contribute to God's work. But what we have been given is not a potential only. It is an absolute responsibility! If we are not "using" the office of Creator now, we may not have the official title bestowed upon us later on in a marvelous resurrection into the creating Family. We are in jeopardy of becoming unprofitable servants of Jesus Christ. If you underestimate yourself, draw back and become fearful to present that which God has given you the ability to produce, you truly have put away in a handkerchief that "talent" or "mina" entrusted to you (Luke 19:20-21). If we allow ourselves to assume a station in life that suppresses our abilities — if we become weary and downtrodden, wrapping ourselves into a cocoon of introversion — we can become like that servant whom Christ called "lazy." We will be guilty of not fulfilling our responsibilities. Jesus Christ encouraged the development of natural abilities. In Matthew 25:21, 23, He said: "Well done, good and faithful servant; you were faithful over a few things, I will make you ruler over many things. Enter into the joy of your lord." Jesus was pleased that the servant was a thinking servant. He accepted with joy the contributions offered. He encouraged by reward. The recognition of our responsibility does not always automatically open the doors to accomplishment. Solomon was inspired to admonish us, "Whatever your hand finds to do, do it with your might" (Ecclesiastes 9:10). We might set out to change our lives, to use our talents and abilities, only to find unexpected obstacles and roadblocks that seriously hamper our efforts. The normal tendency is to become discouraged — to give up — to quit. Joseph, the second-youngest son of the patriarch Jacob, had obvious talents and abilities, much to the consternation of his brothers, who vented their displeasure with him by selling him into slavery (Genesis 37). Joseph was purchased by the wealthy captain of the guard in the household of Pharaoh, the monarch of Egypt, and was given responsibilities that placed him second in command over the household of Potiphar (Genesis 39). However, circumstances suddenly propelled Joseph into a diametrically opposite position, and he found himself in prison, stripped of many opportunities to utilize his many talents. However, God did not desert Joseph during his period of longsuffering: "But the Lord was with Joseph and showed him mercy, and He gave him favor in the sight of the keeper of the prison" (Genesis 39:21). Although he was stifled in his efforts, frustrated by the seemingly inescapable situation, Joseph did not lose heart. He applied himself as the circumstances allowed, and grew in patience and character. And God honored that patience. Through perseverance and diligence, Joseph was catapulted from the depths of prison, with its attendant restrictions and limitations, to the very height of responsibility, as the leader second in command of the entire nation of Egypt. He answered only to Pharaoh himself (Genesis 41:40). Joseph labored with his might — and won the battle. Joseph's example is for our edification and encouragement. The lesson reveals the need for godly character in our lives, in order to ultimately complete our purpose for being. Joseph saw the overview in his mind's eye. He kept the big picture foremost in his thinking. He knew God had a purpose for him personally. Creative fulfillment should rate extremely high on our list of priorities, but patient enduring under less-than-ideal circumstances will produce godly character for all eternity. Remember Solomon's admonition: "Do it with your might." We can develop our talents in all areas of our lives. Notice, for instance, the Bible instruction concerning employer-employee relationships: "Servants, be obedient to those who are your masters according to the flesh, with fear and trembling, in sincerity of heart, as to Christ; not with eye service, as men-pleasers, but as servants of Christ, doing the will of God from the heart" (Ephesians 6:5-6). As employees with the knowledge of God's plan, regardless of where we work, we become employees of Jesus Christ, actually serving in God's work. We become part of the instrument that God is using to shout out the good news of His coming Kingdom to a dying world. We must recognize that as part of the Body doing that work, we should be operating at full capacity. Our minds must be fertile. We must be interested enough and concerned enough in the overall plan that whatever part we have in it becomes an exciting challenge. We must want to contribute ideas, suggestions and proposals. However, in that desire there must be balance. Our approach to those over us should be one of humility. A strutting, swaggering attitude can only lead to strife. Conversely, those in authority, capable and responsible to fairly evaluate the ideas of subordinates, must be careful to never squelch good ideas, enthusiasm or desire, through misguided application of that authority. Leaders should approach any such situation as did Jesus Christ when the productive servants brought increased talents to Him. He is pleased to have thinking employees — thinking husbands and wives, thinking children, thinking, concerned human beings — all working with Him toward the overall goal (Matthew 25:20-23). Paul wrote, "Husbands, love your wives, just as Christ also loved the church and gave Himself for it" (Ephesians 5:25). And, "So husbands ought to love their own wives as their own bodies; he who loves his wife loves himself' (verse 28). Do we husbands solicit input from our wives? Do we encourage as Jesus did? If our austerity has made us "hard men" — rigid taskmasters — we may be guilty of squelching our wives' pursuit of talent development. A husband who rules with the proverbial iron hand can seriously retard the growth that the living Jesus Christ expects from a wife. A husband should help his wife want to be the helper God created her to be (Genesis 2:18). In like manner, the wife who ridicules, resists and argues with her husband can be guilty of jeopardizing his eternal life. Paul wrote: "Wives, submit to your own husbands, as to the Lord. For the husband is head of the wife, as also Christ is head of the church; and He is the Savior of the body" (Ephesians 5:22-23). The husband-wife team has an obligation to the children in the family. During his or her formative years, a child should be encouraged to contribute to the family sphere. He must be made to recognize he is an integral part of the overall picture. Too often the parental tendency, for whatever reason, is to ignore or ridicule suggestions from the young family member. This can be devastating to the pliable young mind that desires recognition and acceptance. Of course, our talents or gifts must be placed in proper perspective. Failure to recognize that all good gifts are from God (James 1:17) can cause an erroneous overestimation of our self-worth. Our respective talents truly are gifts from our Creator, and we are expected to develop any such abilities to the optimum. In Ephesians 6:4 we read, "And you, fathers, do not provoke your children to wrath, but bring them up in the training and admonition of the Lord." This is important to God, important enough that He inspired this passage in Malachi 4:5-6 'Behold, I will send you Elijah the prophet before the coming of the great and dreadful day of the Lord. And he will turn the hearts of the fathers to the children, and the hearts of the children to their fathers, lest I come and strike the earth with a curse." Children are also given an exhortation that will lead to development of real character: "Children, obey your parents in the Lord, for this is right. 'Honor your father and mother,' which is the first commandment with promise: 'that it may be well with you and you may live long on the earth' "(Ephesians 6:1-3). 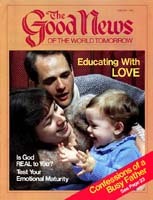 Notice Titus 2:1-5: "But as for you, speak the things which are proper for sound doctrine: that the older men be sober, reverent, temperate, sound in faith, in love, in patience; the older women likewise, that they be reverent in behavior, not slanderers, not given to much wine, teachers of good things — that they admonish the young women to love their husbands, to love their children, to be discreet, chaste, homemakers, good, obedient to their own husbands, that the word of God may not be blasphemed." Here is an exciting command to the elderly to draw upon the archives of their minds to teach. We live in a society that has lost its balance. Rather than using the wisdom of past generations, gained through years of experience and suffering, we look rather to the youths of the world for our standards. Truly, the words of Isaiah ring out loud and clear: "As for My people, children are their oppressors" (Isaiah 3:12). The elderly members of the society have the responsibility to inspire and encourage the youths with their experiences. Jesus Christ inspired John to write, "Beloved, I pray that you may prosper in all things and be in health, just as your soul prospers" (III John 2). God began a marvelous plan in which each of us is destined to play a major role. We are created in the very image of that God — first from the dust of the earth (Genesis 2:7), but for the long range purpose of becoming Creators with Him (I John 3:1-2). The answer, then, is to recognize the ultimate demand for the development of our personal talents. If we are to become Creators, we must first be using the office. The greatest way by which we may prosper is to know that we are needed — to know that our efforts will produce happiness in the lives of others — to know we are a necessary part of the Body of Jesus Christ. We have no excuse for hiding our talents or claiming to be devoid of talents, for being created in the image of the all-talented God necessitates that we be talented! If frustrations, circumstances, environment — even a "hard" man — cause you .to hesitate and procrastinate about developing your own personal talents — if you cannot yet see where those abilities will be used — be encouraged by the words of the giver of all good gifts: "Well done, good and faithful servant; you have been faithful over a few things, I will make you ruler over many things. Enter into the joy of your lord" (Matthew 25:23). Finally, if we are faithful in developing our talents — preparing ourselves for maximum service — we will hear the words, "Come, you blessed of My Father, inherit the kingdom prepared for you from the foundation of the world" (verse 34).